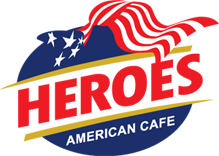 Heroes Cafe offers Stupendous Subs, Burgers, Wraps and Salads. We use the best deli meats, fresh ground beef (never frozen) and real cheese. Our produce are fresh and delivered all the time from the sources around. The Heroes’ Team works really hard and fast to bring you great tasting food made to order. Our menu is awesome with lots of great choices. We are known and loved for our Philly Cheese Steak, Gourmet Burgers and over-sized Burritos. Our customers also really love the Pastrami and Swiss, Cuban, and Turkey Bacon Avo. They say we have the best fries around. Sliced Pastrami with melted Swiss Cheese on swirled Rye bread. topped with tomato, lettuce, red onion, Kosher dill pickle and Dijon Mustard. Fresh Veggies (Bok Choy, Kale, Cabbage, Carrot, Onion, Corn, Green Peppers, Mushrooms and Broccolli) sauteed to order with Chicken or Steak. 1/2 lb. hand patty beef stacked with a Philly Cheese Steak on top. Served with tomato, lettuce, onion, mayo, mustard and pepperoncinos. 1/3 lb. hand patty beef made with sauteed mushrooms and red onions, swiss cheese and ranch dressing.